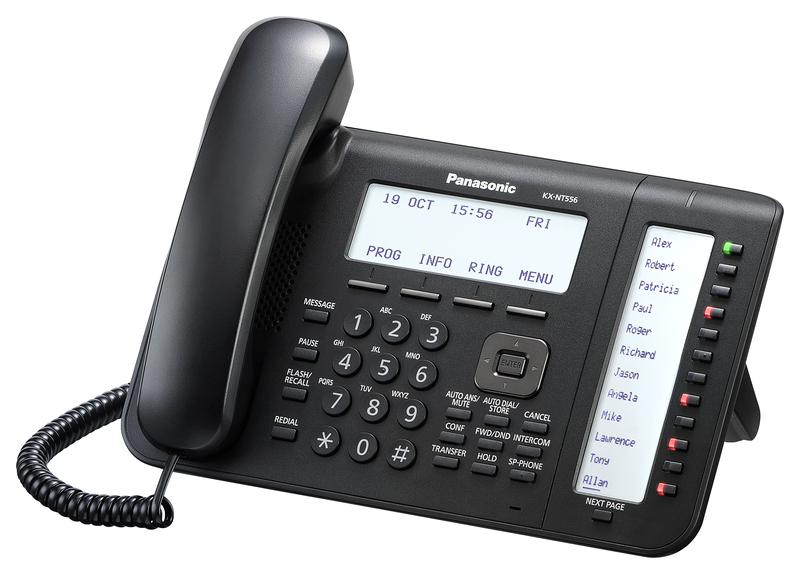 The KX-NT556 IP telephone delivers exceptional professional performance. It takes you to a new dimension in audio experience, thanks to excellent HD quality audio, combined with easy access to powerful supportive features and applications. The sleek, ultra-modern design, available in both black and white colour options, works well with any office decor. Packed with a host of features, the KX-NT556 couldn’t be simpler to use, with a gigabit LAN/PC port meeting the increasing requirements of office IP networks and a self labelling feature making initial setting and remote maintenance easier. It also supports DSS connectivity for operator-type users. The KX-NT556 offers best-in-class audio quality, meaning fewer repeated conversations and misheard calls. Coupled with Enhanced Echo Cancellation and an Expanded Acoustic Chamber, the KX-NT556 delivers a superior audio experience to users over handset, speakerphone and optional headsets. It also features wideband-compliant, hearing aid compatible handsets, and built-in, high-quality speaker and microphone. A built-in Electronic Hook Switch (Plantronics compliant) port allows the KX-NT556 to have access to the Plantronics range of DECT enabled headsets. This offers portability and comfort, as frequent users are able to move around freely, without being tied down by handsets. Up to 36 numbers can be registered. Since the numbers are displayed on the screen, a paper label is not required.